Alabama might have finished national signing day with the No. 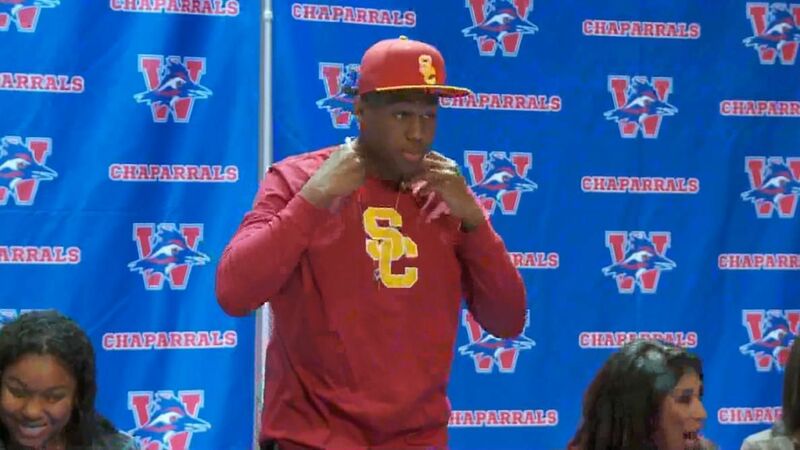 1 recruiting class in the country -- its fifth top-ranked class in the past six years -- but USC enjoyed the biggest rise, pulling in the Pac-12's top recruiting class on Wednesday. Highlighted by the signing of LaBryan Ray, the No. 17 overall player -- and second-ranked defensive end -- in the ESPN 300 rankings, the Crimson Tide now have 21 ESPN 300 commitments, which is the most in a class since ESPN started keeping rankings in 2006. Alabama also has two ESPN JC 50 commitments. Alabama also signed receiversHenry Ruggs III (No. 166 in the ESPN 300) andDevonta Smith(No. 227)on Wednesday, while four-star defensive tackle Phidarian Mathis committed on Tuesday. Nick Saban's class is so deep, he had to tell ESPN 300 defensive end Jarez Parks that the class was full and there was no room for him to sign. A source close to the program told ESPN that while Parks has committed, he would have to grayshirt and wait until next January to sign and enroll at Alabama. The No. 1 overall recruit in the ESPN 300, offensive tackle Trey Smith, signed early with the Tennessee Volunteers and enrolled early. Entering signing day, 93 players in the ESPN 300 rankings had enrolled early. The lone remaining five-star uncommitted prospect in the ESPN 300,Marvin Wilson, committed to FSU on Wednesday, selecting the Seminoles over Texas, LSU, TCU and South Florida. The fourth-ranked player in the ESPN 300 capped off a solid class for FSU. Wilson, a product of Houston's Episcopal High School, gives the Seminoles 13 commitments/signees who are ranked in the ESPN 300. USC coach Clay Heltonhad a strong class in his first season a year ago --bringing in a class that was tops in the Pac-12 and ninth overall in a composite ranking -- but his second season in the recruiting chair was even better. The Trojans landed four-star receiverJoseph Lewis, ranked 16th overall, among their 14 ESPN300 commitments/signees Wednesday. It started early for the Trojans with linebackerLevi Jones, the 65th-ranked player in the ESPN 300 out of Austin (Texas) Westlake High School, choosing the Trojans over Florida State, Florida and UCLA. The 6-foot-4, 215-pound linebacker visited all of his finalists, but he said it was his visit on Jan. 20 that persuaded the four-star prospect to sign with the Trojans. Jones put a different spin on the pick-a-hat ceremony as he revealed his decision. He took off his jacket to reveal a long-sleeve Florida T-shirt. He then pulled off the Florida shirt to reveal a Florida State shirt underneath. He then removed the Florida State shirt and was left with a USC shirt on. Jones then put on a USC hat and said, "Fight on." The Trojans weren't done there, as they also landed offensive tackleAustin Jackson(No. 54 in the ESPN 300), No. 1 receiving tight end Josh Falo(No. 92 overall) and defensive tackle Jay Tufele (No. 119). They also got athleteGreg Johnson(No. 116), who is a teammates of Lewis' atLos Angeles' Augustus F. Hawkins High School. Helton downplayed the big day. "As a coach, you can't get caught up in the stars or the rankings," Helton said. "You have to look at the holes you need to fill and the needs you need." LSU also enjoyed a productive signing day -- its first under new coach Ed Orgeron. The Tigers signed Under Armour All-American K'Lavon Chaisson, the fourth-ranked defensive end who is ranked No. 34 overall in the ESPN 300. LSU also landed four-star safetyTodd Harris(No. 83) and linebacker Tyler Taylor. In all, the Tigers now have 15 ESPN 300 signees/commitments. Orgeron is attempting to have the highest-ranked recruiting class by a new head coach since ESPN's rankings began in 2006. Urban Meyer had the No. 6 class at Ohio State in 2012, matching the ranking of Jimbo Fisher at Florida State in 2010. Michigan also made a splash by landing a commitment from Aubrey Solomon, the 63rd-ranked player in the ESPN 300. The fifth-ranked defensive tackle in the country picked theWolverinesover Alabama and Georgia. Solomon originally committed to Michigan several months ago, but he backed off that pledge when he received a thank-you note for a Michigan recruiting event that he never attended. Jim Harbaugh and his staff were able to overcome the small blunder to sign one of the top defensive linemen in the country. Michigan now has 17 ESPN 300 commitments/signees and currently has the fourth-ranked recruiting class in the country, trailing only Alabama, Georgia and Ohio State. Jeff Thomas, the eighth-ranked wide receiver in the country and No. 55 overall in the ESPN 300, announced his commitment to theMiami Hurricanesover Tennessee, Illinois and Oregon. Coach Mark Richt has put together a solid class for the Hurricanes by landing 10 ESPN 300 players. Under Armour All-American DE Markaviest Bryant (No. 100) signed with Auburn. He also had offers from Alabama, Arkansas, Georgia and LSU. CB Chevin Calloway (No. 120), another Under Armour All-American, signed with Arkansas. Calloway, who originally committed to Iowa, also had offers from Nebraska, Ole Miss, Texas and Texas A&M. Leonard Warner, the second-ranked inside linebacker in the country (No. 130), committed toFlorida Stateover Georgia andStanford. Javon Kinlaw(No. 17 in the ESPN JC 50) signed withSouth Carolinaover Texas A&M and Tennessee. Charlie Strong, who landed with South Florida after being fired at Texas, had two notable signings in his first class for the Bulls -- four-star receiver Kevaughn Dingle, who had originally committed to the Hurricanes, and cornerback Naytron Culpepper, who chose USF over Maryland, Michigan State, Mississippi State and South Carolina. The Longhorns' first class under coach Tom Herman will rank outside the top 20 nationally, making it one of the lowest-rated UT classes since the ranking started more than a decade ago. It also will not include any of the players ranked among the 10 best in the state of Texas. Hunter Rison, the son of former NFL receiver Andre Rison, signed withMichigan State, the same school where his father was a star.Hunter Rison is also a wide receiver. He's already enrolled at Michigan State and will participate in spring practice. Best name of the day? That goes to Illinois State signee Kobe Buffalomeat, a 6-foot-7, 287-pound offensive tackle from Lawrence, Kansas. After tweeting the signing, the Redbirds commit quickly became an Internet favorite. Deommodore Lenoir, a four-star athlete from Los Angeles, pickedOregon. Levi Jones starts with Florida, switches to Florida State and then changes shirts at the last moment to USC.